On February 17th Nancy posted “Dirt the Story” and “Dirt the Video” about our car break down and towing episode. This is the aftermath of that repair. Based on the cost of food & personal items (for example cheddar cheese, peanut butter, and suntan lotion), I was ready for a bill that would drain the bank account and make air travel look cheap again, but then based on the bill for my new glasses (see “finally a deal-Feb16th") I thought we might get off cheap. 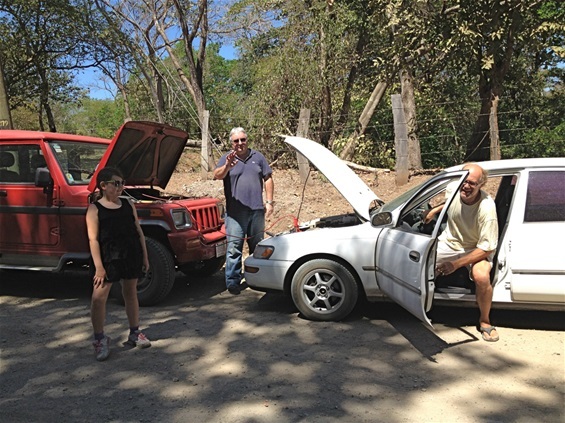 Who knew, but I was a bit worried especially since our neighbor Joy had just told her son to stuff a new starter motor in his luggage for her Toyota 4x4 when he came in from New York because it was going to so expensive. As I suspected it was the alternator in our car that went out - draining the battery as we drove, until it finally quit on Dust Bowl Highway. Prior to leaving Lake County, I had to replace a alternator. Pretty simple, but expensive - 200 bucks for a new alternator and 200 bucks for labor. The thought of just fixing the broken alternator part was never even discussed. Down here they still fix stuff, partially because labor is cheap, and partially because they can’t get new stuff cheap. So they removed the alternator, disassembled it, replaced a few parts, put it back together, and reinstalled it. Parts $24. Labor $36. So far, glasses and car repairs look like a deal. A chicken? Not so much.